My Vibram Five Fingers were coming to the end of their lifecycle so time to look for some new shoes. 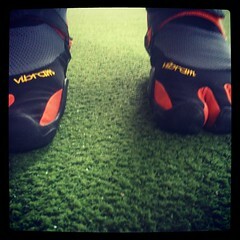 Am a big fan of the Vibrams, so was definitely looking for something with a zero drop or minimalist shoes. IE thin soles so you have maximum connection to the ground you run on. The vibram model I had were not that brilliant for off-road conditions nor wet conditions. Those were on the requirements list when looking for something new. 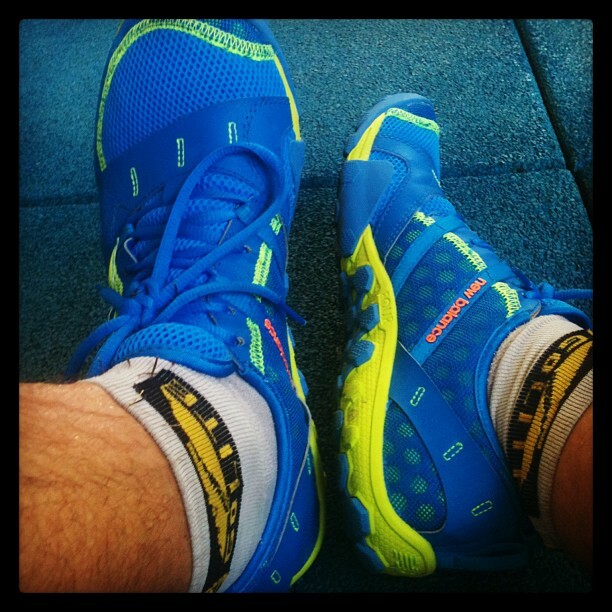 Came across those New Balance Minimus, tried them on and they fitted well. And as there was some interesting pricing going on I could buy 2 pairs of those instead of 1 pair of 5 fingers. The first few times I have been using them for CrossFit like activities. Meaning lots of jumping, push ups, pull ups, squats and the like. Stability and grip are important I find...and the shoes passed the different test thrown at them. Not as much contact as the five fingers, though definitely a lot more than some asics I still had. Today I decided to do another run with them to figure out how they would behave there. When lacing them up properly they do give a similar snug feeling as the V5F shoes which I really like. The small drop was fine and I really did like the grip of the shoes. The grip with the connection provides nice agility when running. Although only just over 5KM, the shoes felt good and would support longer runs nicely. So far so good! The next test will be taking them offroad and/or run in rainy conditions!